We would like to send out a huge congratulations to Dan and Erin Serafini of Star Street Farm, on the purchase of the 2015 inutero foal by The Twain and out of Lady's Comet. 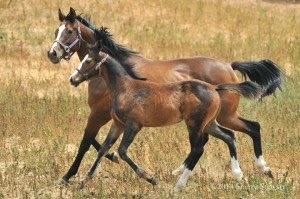 This baby is the full sibling to sensational stallion prospect, Soul Twain DF (owned by Natalie Jensen). This foal brings the finest of Thoroughbred sport horse blood to the forefront, with champion eventers on both sides of the pedigree. The sire side represents over 40 current WEG, Olympic, and Four Star top ten finishers, as well as the 2013 USEA YEH Four-Year-Old Champion, Classic Twain DF. The dam is a sister to the incomparable American Champion, Courageous Comet, who has represented the United States at the highest levels of Eventing.